Victims of historical child abuse are being forced to take their fight for justice to the courts after being "abandoned" by Stormont's warring politicians. In January a landmark report into state and church abuse recommended compensation, a memorial and a public apology to abuse survivors. Dozens of victims had given evidence during a four-year public inquiry about the abuse they suffered as children in care. However, the collapse of the Stormont government has meant a promised redress scheme has not been set up. A lawyer for abuse survivors, Claire McKeegan of KRW Law, said they now face the trauma of lengthy court proceedings for justice. Ms McKeegan said redress is not a "windfall" for victims but constitutes the discharge of the debt owed to them by the state, the church orders and the relevant institutions "that so grievously failed them in the past". "Despite the HIA Inquiry recommendations that survivors of abuse are entitled to proper redress, the government have yet to suggest let alone implement any such scheme. "In the absence of any redress scheme with backing from the institutions and the state, we have no alternative at present than to advise our clients to issue and prosecute proceedings through the courts," said Ms McKeegan. She added: "It is a further wrong perpetrated on these victims to require them to wait indefinitely for compensation and the care and assistance that they are entitled to and so greatly need." 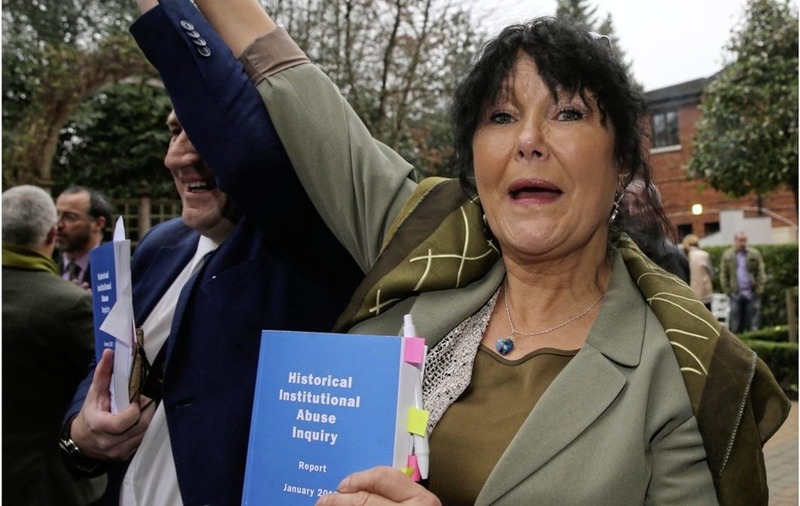 Margaret McGuckin, of the campaign group Survivors & Victims of Institutional Abuse (SAVIA) said: "We have all had enough of this mess and many of us are at breaking point. "We have been left feeling like we are begging our politicians to care for us, but they never listen. We have been abandoned again." She added: "We just don't know where to turn for help. I unfortunately can see more of our people passing on without justice." Secretary of State James Brokenshire recently admitted in a letter to DUP MLA Alex Easton that the implementation of the recommendations was not likely to happen soon. He said as the report was commissioned by Stormont's first and deputy first ministers in 2012, they were obliged to lay the report in the Assembly. "Given the current political situation in Northern Ireland, this is not likely to be imminently possible," he said. "Redress is not a "windfall" for victims but constitutes the discharge of the debt owed to them by the state, the church orders and the relevant institutions "that so grievously failed them in the past". Get it into court as quick as possible, I guarantee most who went through the joke of a redress board here given the benefit of hindsight would of preferred the court option where the awards would be proper legal Damage's and jailtime for the abusers, instead of complete freedom for abusers and survivor's having to beg the sad sacks in caranua for a fridge or whatever. Michael, that's for sure in a nutshell! In hindsight if I knew then what I know now it would have been the court option for sure, robbed blind no justice not even an apology. Denied Access To Irish Justice Via The Courts Surely Is In Violation Human Rights. Everybody Needs To Know The Real Contribution Survivors Of State And Church Abuse Make To The Pursuit Of Real Peace And Justice In Ireland. Yep I know my abuser is still around never punished so how can I ever get past it. It is the biggest regret of my life letting the redress board make a fool of me, the legal profession let us down badly its no wonder the Irish human rights commission wouldn't help us they didn't want to upset their lawyer buddies and their pay check providers the gov, survivor's in other places need to know grab your shot at court. Absolutely Indeed Agreed Michael. It Really Is Extremely Hard To Get Over The Past In The Present When Justice Is And Continues To Barred By Those Involved In The Abuse (The Political Parties). I Note How Certain Guilty People Have Steadily Risen In Their Professions Be They Clergy, Doctors Or Psychiatrists (Etc). They Breathe. As If Human. Politics Is The Home Of Paedophiles. It Is The Place To Hide. The Handler Political Party Will Use For All Manner Of Acts And Protect From The Threat Of Justice Until Cross The Line. Irish "Society" Still Does Not Yet Get Who We Are. We Are The Coming Saviour. Surely justice should over ride any self serving agreement dreamed up by criminals. Faceless. No Human Contact. No Human Touch. Not Human.